Gunmen in Sri Lanka have fired on a bus, killing a supporter of opposition candidate Sarath Fonseka, police say. At least four people were wounded in the attack in the south of the island, officials added. The unidentified attackers were riding on a motorbike when they sprayed bullets into the bus, police said. The 26 January presidential elections are taking place amid heightened political tension. 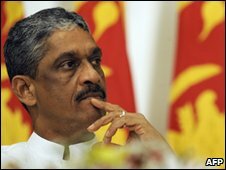 Gen Fonseka is the main rival to President Rajapaksa. He resigned from his post as chief of defence staff in November following differences with the government over who should take credit for defeating the Tamil Tiger rebels last May. Previous elections in Sri Lanka have been marred by violence and Tuesday's attack brought calls for the authorities to ensure a free and fair vote. The fatal shooting, near the town of Hungama, was the first killing in the run-up to the ballot. There have been dozens of other, less serious, instances of violence ahead of the election. The woman activist killed on Tuesday was about 60 and had been heading for an opposition rally. In a statement, the Centre for Monitoring Election Violence (CMEV) said two attackers on motorbikes shot at the tyres of the bus before opening fire on its rear windows and passengers inside. "One person was killed instantly, another opposition supporter was hospitalised and several others had minor injuries," a police officer, who declined to be named, told AFP news agency. Earlier the president proposed power-sharing arrangements for minority Tamils ahead of the presidential vote. He said that he wanted to create a second chamber in parliament to allow more Tamil representatives to have a say in law-making. "The end of the war does not mean the end of the conflict," President Rajapaksa told foreign reporters at his Temple Trees residence in Colombo. "We need to politically address the needs of Tamils." The president also announced a $4bn (£2.4bn) fund to rebuild the island nation's war-shattered north. Correspondents say the Tamil vote could be decisive in the election. 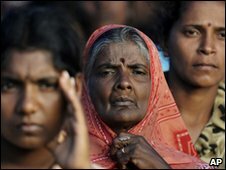 Sri Lanka's 2.5 million Tamils make up about 12.5% of the population. Both President Rajapaksa and Gen Fonseka are eager to win Tamil support in the event that the majority Sinhalese vote is split between them. Last week the Tamil National Alliance (TNA) - which has 22 seats in the 225-member parliament - announced it was backing Gen Fonseka. Both candidates have been campaigning in the northern Tamil heartland of Jaffna - which correspondents say would have been unimaginable a year ago, when fighting raged between Tamil Tigers and government troops elsewhere in the north. The rebels - fighting for a separate Tamil homeland - were defeated by the army in May, ending 26 years of civil war.